Okay, before you start packing you need to look at some logistics. You need to decide when you will be able to go home (if at all) during the year. If you can go home as frequently as you like–you probably don’t have to pack as many clothes. On the other hand, if you are far away from home and exchanging clothes will be an ordeal–you will need to pack more clothing. For example, if you know that you will be able to go home before it starts getting cold–don’t pack winter clothes yet. On the other hand, if you won’t be home and you don’t want your parents to mail you any winter clothes, you may need to pack those clothes so that you have access to them. Do you plan to go through sorority recruitment? You will definitely need at least a few dressier items to get you through recruitment as well as general sorority activities. Do you plan to work out a lot? If you plan to hit up the campus gym, you need clothes for that so don’t forget to bring several items of clothing to work out in. Do you plan to go to events on campus? What kind of events do you plan to attend? Do you have an awesome comedian coming to campus or a theater show coming that you want to see? What might you wear to that? If you think about some of the events you plan to attend before you go to college this can be really beneficial. This will help you remember that you need to bring special occasion outfits and also condense how many special occasion outfits your bring. To expand, think about the special dress you bring for recruitment–can you wear that same dress to another event that you plan to attend? If so, you have potentially brought the number of special event dresses you need down by one which is great because dresses are difficult to pack and take up a lot of space. A lot of people want to come to college and become a completely different person. One way to be a completely different person is to dress like a different person. I think the biggest thing that college students must understand is that while you can re-invent yourself–you don’t have to. There are many aspects of yourself you can and should keep exactly the same. So, don’t bring a million pairs of heels to college if you don’t wear them now. You may want to bring 1 or 2 pairs of heels for special occasions but don’t force yourself to love wearing heels if you just don’t. The same goes for any item of clothing like a crop top, dresses, or anything in between. Dress how you like to dress and be yourself. You can’t bring every item of clothing to college with you so you have no room for clothes you don’t like. Every item of clothing you pack needs to be an item of clothing you have worn and love. If you are buying new clothes for back to school, try to wear it a bit before you put it in your suitcase for college. The reason? You don’t want any item of clothing taking up valuable space in your closet if you don’t like it. You want to make sure that the clothing you have in your dorm room actually matters to you. We all have those clothing items at home that we have but don’t wear, but at home, you have way more space. In college you are living in a small space so you want to make sure that your clothes fit well, look good, and make you feel great. When you are evaluating your clothes, ask yourself the following? How does the item of clothing make me feel? Can I bend or move in this properly without showing things I don’t want to show off? Is this item to loose, too tight, or just right? Can I see myself wearing this frequently? How often have I worn this? When deciding what to pack for school I would consider looking through your Instagram feed. Hear me out. You probably have a ton of outfit of the day pictures on your Instagram feed, and if it’s not on your Instagram feed check out your camera. Is there any piece you find is frequently a part of your daily outfits? If that piece is in good condition you probably want to make sure you add it to your collection of clothes to bring to college. Like we talked about earlier your style will probably change a bit in college, but it doesn’t have to have a major overhaul. You will wear certain pieces over and over again. It’s just something that is a part of life in my opinion. I don’t mind wearing clothes over and over again though. If I like a piece, I am going to wear it again. 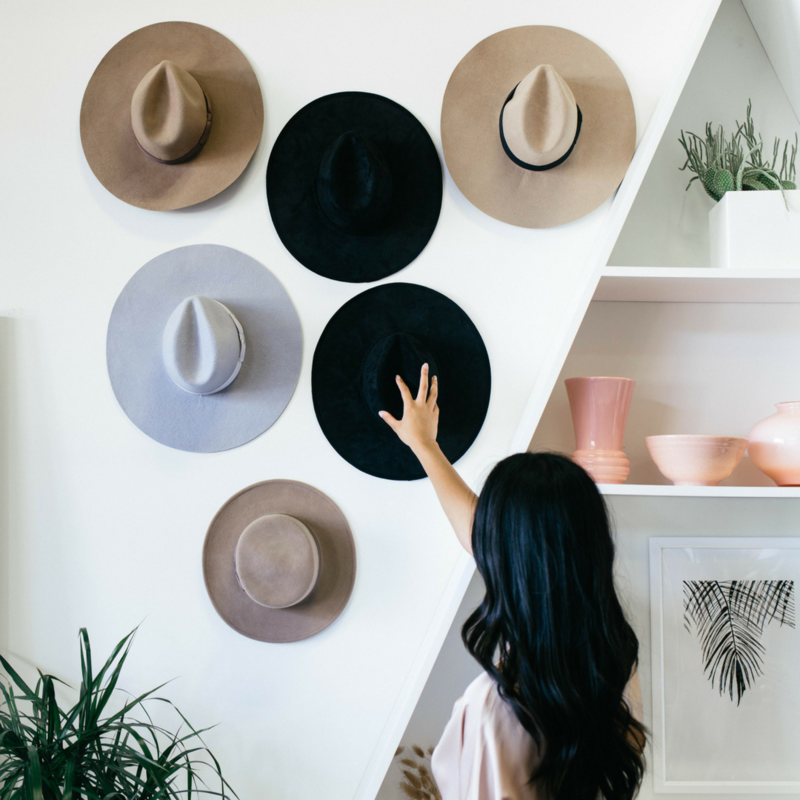 Basic pieces need to be a staple in your college wardrobe because they can be dressed up, dressed down, and most of them can be easily stored in various places. My favorite place to shop for basics is Old Navy, but then again, I just love Old Navy. They have amazing basic shirts and tanks, dresses, pants, etc. You can usually catch them in a good sale as well. If you live nearby one, go to an Old Navy Outlet because they have AMAZING deals all the time there. So, what kind of basics should you look for? Tanks & Shirts: Tanks and shirts make great basics. One, they are super cheap, and two you can dress them up in so many ways. You can wear them alone for a more casual look or you can pair them with a nice cardigan or kimono for a more dressy look. Basic shirts also look great with overalls or under a dress for a fun dressy-casual look. There are so many things you can do with tanks and shirts! Pants & Shorts: Old Navy has a ton of basic pants and shorts that you can buy. Their Pixie Pants are my absolute favorite and they come in so many patterns and colors. They also have amazing denim jeans as well. Dresses: Another reason I love Old Navy is because of their basic dresses. They have a ton of cute fit and flare dresses that are perfect to wear to class. I am not a super tall person but I am not super short either (I am about 5 foot 7 inches. These dresses are a great length for me. I don’t feel self-conscious about where they hang on my body. I am an accessory queen. I loved getting cute and fun accessories throughout my time in college as I truly believe they can dress up any outfit. Your jewelry doesn’t have to be expensive. Some of my favorite pieces I picked up at $1 jewelry stores. You just have to be able to take care of your jewelry items. I would invest in a t-bar jewelry holder. This may take up some space in your dorm room, but if you wear a lot of jewelry it can be a great way to organize it all while stopping it from getting all tangled. If you wear a lot of costume jewelry you know that as soon as you get it pretty tangled, it’s basically useless so purchasing a t-bar or three for jewelry organization can be helpful. I love this one on Amazon. It’s $18 but it is a three-tiered t-bar so it has space for necklaces, bracelets, headbands, whatever you want to put on it. Now that you have some organization? What kind of jewelry should you get? I love purchasing pearls (I won’t tell if they are fake, girl! ), bangles, headbands, cute and colorful statement necklaces, etc. I also suggest that you invest in one or two really awesome necklaces. In college, I invested in a really cute simple pearl necklace, but I wore it all the time. Even now I wear it, and I got that thing during my sophomore or junior year of college. You really need to dress appropriately for the weather that you will be living in. Especially if you are moving out of state to go to college, don’t just consider what Welcome Week weather will look like, do some more research on the climate of the state you are going to. Think about the overarching trends. Does it rain a lot there? Make sure to pack rain boots, an umbrella, and a rain jacket. Does it snow a lot there? You may have to bring some winter clothes in earlier than expected. Is it unbelievably sunny most of the time? Don’t forget your sunblock because you may be wearing it way more often than you think. It is important to really understand the climate of the place where you will be attending class so that you aren’t expecting one more month of summer when you should only be expecting two weeks. You don’t want to be caught in a new town with inappropriate clothing for the campuses climate. Climate is great because it deals in averages but your school’s climate is not guaranteed. You may be walking into an unseasonably warm fall or an unseasonably cold fall. It is important, though, to do your due diligence while you are packing so that you will run into fewer issues. Ahh, I hated doing laundry in college, but it’s kind of a necessary evil. When I was in my freshman year at UCA I used to wake up extra early on Mondays and Wednesdays to do laundry because I didn’t have my first class until 11 AM so I would do my laundry then. You want to think about when you would actually do laundry or when you like to do laundry. If you do laundry a lot you may not have to bring as many clothes, if you don’t do laundry a lot you may have to bring more. Above all else, make sure you have enough underwear to survive if you don’t like doing laundry all the time. Laundry in college can be a pain if you let it be. Obviously, DO NOT TRY TO DO LAUNDRY ON SUNDAY. Everyone’s laundry day is Sunday in college. People will move your stuff around because ain’t nobody got time to play on Sunday. Instead, choose a low traffic day, and understand that you may have to do laundry at strange times. For me, it was around 7-8 AM on Mondays and Wednesdays because no one was doing laundry at that hour. Observe your dorm mates to see when they use the laundry the most. Work around their schedule so you can take your sweet time while doing laundry. Last, but not least, understand that what you pack will not be all that you have to wear. You can plan all you want, but chances are you may forget something, or you just like to shop. You will pick up extra clothes here and there from all the t-shirts you get during Welcome Week. It’s okay to pick up extra clothes here and there. You will probably want to because you may have more room in your closet than you think before you go to school so you want those random items of clothes. As long as they fit you well and you can wear them over and over again there is nothing wrong with adding more items of clothes if your close can handle it. Remember that you will have to drag all this stuff back to your house eventually, though. 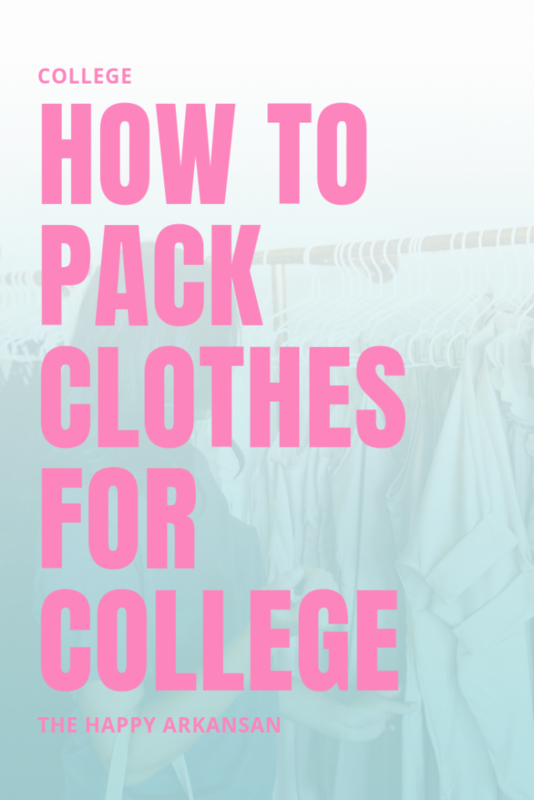 I hope that this gave you some food for thought as you plan what to pack for college in the clothing department. I plan to share thoughts on other things you may pack throughout the summer like how to pack toiletries for college and how to pack office supplies for college so be on the lookout for those throughout the summer. Amanda, great ideas. I didn’t know there are so many factors to consider before packing for college. This brings so ease. Thanks for doing this post.